In China cooking beef methods are various. Northern Chinese like stewed/braised dishes, the most famous one is Braised Beef with Potato(土豆烧牛肉）. People from northwest like to eat Beef Noodle Soup. Actually they eat more beef and lamb than any other areas. China's two famous beef noodle chain restaurants are both from northwest. They are Lanzhou La Mian (兰州拉面) and Xinjiang Beef Noodle Soup(新疆牛肉面). Talking about noodle, many Taiwanese make very good beef noodle soup. Beef and lamb have warm energy. That's why northern people eat them more, and people from Guangzhou and southeast Asian eat less. But like Taiwanese, Cantonese are gourmet, how can they give up delicious beef? So they invented Beef in Oyster Sauce. It's a quickly stir fry dish. As it is done within a few minutes, it won't bring us too much heat. Shanghai is in between north and south. They eat some beef and lamb in winter, but very less in other seasons. When cooking beef stir fry dishes, you must marinate beef first, then stir fry quickly. This will keep beef tender and soft. Chinese beef stew dishes need to cook above 90 minutes（small blocks) to 120 minuets(big blocks). The meat will be very hard if you cook shorter time. You can prepare more when stewing beef at one time, and store them in fridge for 3 to 4 days. 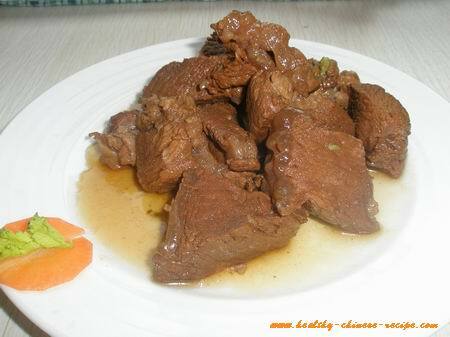 You can this stewed beef to cook delicious beef dishes quick and easy. For example, to make Braised Beef with Potato, heat oil, add seasonings, add stewed beef and potato blocks. Stir fry for seconds and then simmer for 30 minutes. Other ground beef recipe include Stuffed Beef Pancake, Stuffed Beef Dumpling, Beef Ball Soup, Beef served in hot pot, etc. Chinese Beef Jerky is a snack, which you can find in supermarket. Chinese Beef Skewers are irresistible street food. Usually, beef tenderloin is the best part to cook stir fried dish. Beef brisk or beef belly is better to cook stewed dishes. Beef shrank is better for beef in soy sauce (酱牛肉）.